Lady Macbeth is a fictional character in William Shakespeare's play Macbeth (c.1603–1607). She is the wife to the play's main character, Macbeth, a Scottish nobleman. After talking him into killing the king, she becomes Queen of Scotland. Later, she feels bad about her part in the crime. She dies off-stage in the last act. This is thought to be suicide. The idea for the character came from Kings Duff and Duncan in Holinshed's Chronicles (1587), a history of Britain familiar to Shakespeare. 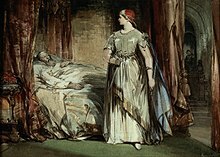 Shakespeare's Lady Macbeth appears to be made up of two personalities in Holinshed's work. These are Donwald's nagging, murderous wife in the account of King Duff and Macbeth's ambitious wife in the account of King Duncan. List of all appearances and all mentions of Lady Macbeth in the play. This page was last changed on 18 April 2017, at 11:13.